Location: Châtenay-Malabry, in the Hauts-de-Seine departement of France (Ile-de-France Region). Notes: Vallée-aux-Loups is the name of a property located at 87 rue de Chateaubriand in Châtenay-Malabry in the Hauts-de-Seine, in Val d'Aulnay. It was occupied by François-René Chateaubriand of from 1807 to 1818 and is now protected as historical monuments by two successive arrested. Now county museum, the Maison de Chateaubriand offers temporary exhibitions, performances, guided tours, lectures and debates, meetings and has a library dedicated to Chateaubriand, Romanticism and French in the nineteenth century.The house was built in the late eighteenth century by a wealthy brewer, André Arnoult Acloque. 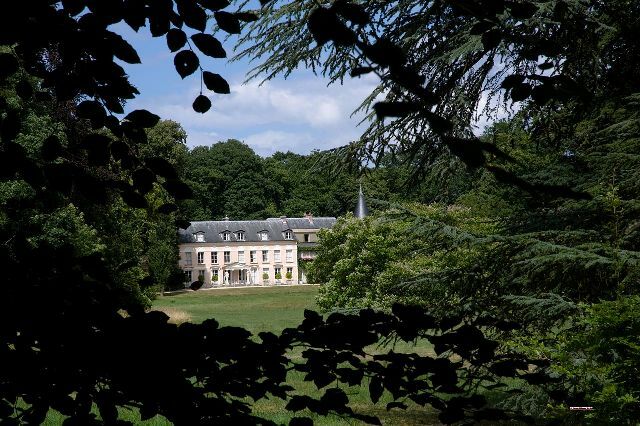 August 22, 1807, Chateaubriand acquired the domain of the Valley of Wolves in the hamlet of Aulnay, priced at 20,000 francs, probably thanks to a loan from the Countess de Choiseul-Beaupré. There he wrote many of his works, especially the memoirs from beyond the grave, in the Velléda tower (named after the heroine of the novel Les Martyrs) where he had laid out his office and library. He laid out the area and created the park of the Valley of Wolves on 14 hectares. After losing her state cabinet post in 1816, he found himself in a dire financial situation. The area of ​​the Valley of Wolves was then sold and bought by Mathieu de Montmorency, a friend and creditor Chateaubriand. He built a wing with tower and an orangery. The estate was passed by inheritance to the Dukes of La Rochefoucauld-Doudeauville who made significant improvements.